1. Higher technologies prove very dangerous and are somehow (probably impossible in real life) effectively outlawed and/or regulated. 2. The player represents an individual or faction from a transcendant culture who has gone through a singularity, converted their solar system and/or neighboring systems into computronium, and sees space exploration as pointless, but our protagonist has somehow retained the human drive for exploration and adventure, and thus chooses to disregard the higher technologies in favor of a flesh-and-blood old-school ship, a kind of aesthetic luddism. He only relies on the higher technologies to mitigate his all-too-human attention span (same as the real players'). 3. The protagonist ship represents the first, early interstellar mission, with currently plausible technology. Leaving Sol behind, knowing they may never return, they head for the stars. Along the way, they gradually discover higher technologies, either through alien artifacts, or through centuries of automated scientific research by the ship's AI. This could account for the upgrading gameplay. Of course, we'd want FTL to be one of the early discoveries, and that should imply nanotech and other advanced techs either before or around the same time, and that brings us back the start of this exercise. Perhaps there is some contrived reason they can't return to Sol system. 4. FTL and/or ZPE and/or Nanotech and/or EM manipulation is only possible via an alien artifact that cannot be reverse-engineered. The artifacts only work in a very specific way, and hence we don't need to worry about the whole complex cascade of technology implications. The ship could be designed around a really strange, unique visual element for the alien artifact, and the rest of the ship's modules have more recognizable truss-and-tank style elements jutting out of it. Gameplay could focus on hunting down more of these artifacts (similar to what you mention in the TODO list), which restrict the number of possible jump drives, etc. I personally really like this option. Polymorphic ships are hard to implement, and are much too hard for players to understand. I think we should leave nanotech for building (nanoassemblers) and repairing (ship buildt with nanocells itself). This is too bulky and an immovable system. It may be useful for colonies and orbital stations, but not for spaceships. Thermonuclear reactor/engine or thermonuclear-with-antimatter-catalyzer reactor/engine is more plausible and useful as a technology. Faster-than-light transition of the ship can be a collateral effect of ZPE production, so ZPM and hyperaccelerator engine (FTL engine) can be the same device and called a "core". These are the only two fantastic technologies that I will allow. Comets are too fragile and cannot survive ship acceleration. Also, comets are composed from water and ammonia, but main engines use hydrogen, so 90% of ice mass is unusable. But extra mass is a "penalty score" for the spaceship. With these three: Crew can live in special "fluid sectors" filled by perfluorocarbons for liquid breathing. Other ships can have diamagnetic compensators. Big passenger ships and stations can have rotating sectors, but some passenger ships can be designed to travel with constant acceleration to create constant artifical gravity onboard. The player's mother-ship does not need a crew because it has full automatization. The player can control all his fleet remotely using quantum communication system. But there will be quests for transporting 100k people to a newly built colony, to gather a team of exobiologists and to research the planet for life, etc. with the same spirit that Rodenberry went for with the Enterprise, minus the “you’re doing it wrong” deck orientation and asymmetry (here's a fun redesign I did). lol, it's really funny. And much more believable. The design might also or instead center around the FTL drive itself. Yes, recently I have suggested the design of the FTL drive to be in the form of a gimbal. It may have 3 or more rotating rings and occupy 30-50% of ship's area in size. If you have good modelling skills and realistic ship design ideas, you are welcome to join SE team! This is too bulky and stationary system. It may be useful for colonies and orbital stations, but not for spaceships. Only the tethers would be stationary, they would generate energy to power huge lasers that could beam the energy to anywhere the ship is. Anyway, I'm for the integrated ZPM-FTL core for the mothership, the beamed energy thing is just something I've really wanted to see in a game as a gameplay mechanic. Thermonuclear reactor/engine or thermonuclear-with-antimatter-catalyzer reactor/engine is more plausible and useful as a technology. Wait, antimatter too? Perhaps it is generated by the core. But this must be one powerful starship. Lots of stuff going on. Comets are too fragile and cannot survive ship acceleration. Also, comets are composed from water and ammonia, but main engines use hydrogen, so 90% of ice mass is unusable. But extra mass is a penalty score for the spaceship. I see. I hope comet/asteroid collection and mining will still be a gameplay aspect. One question though - is the shield necessary for FTL? Or just the 100,000km/s max 20g sub-light speeds? Will mass affect the FTL drive performance? I feel like the diamagnetic compensator tech is unnecessary if we have the other two, unless you go with more EM stuff like magsails and ramscoops. If the player is immersed, the "cockpit view" would be interesting, but I guess it would be fully augmented reality, just hooked up to the nervous system or projected through contact lenses. The player's mother-ship does not need a crew because it has full automatization. Wait, so the player is not a human? The mothership is completely AI-controlled? Is the player the AI? The player can control all his fleet remotely using quantum communication system. Wait, FTL quantum communication!? A third impossible tech? I'd really like to see a game that simulates realistic restrictions on communication. Since the game is focused on exploration, I feel like it should be a personal journey, focus on only the player's location, flying to a new star, transatmospheric landing, roving around on the surface in person. Just to set your footprints. Relativity-restricted communication goes hand-in-hand with this. If we can fly anything at any time anywhere, I feel like it cheapens the rewards of exploration. A lot of forum members are saying they like the single-player aspect, but the community would be nice too. This works well with this concept - solitary exploration (or with a few companions either on your mothership or in a close group), and coming back to a communal, inhabited system for information exchange and a sense of community (it would even emphasize this feeling, like coming in from the cold). If we have FTL communication, this is pointless. An exception I'd make would be for FTL communication only within your current system, or in a volume of, say, 1 lightyear, for practical purposes. Also, maybe players could build up an FTL communication structure, so the number of systems connected by FTL comms is limited in number and only grows very slowly, and exploring new systems will still be a lonely activity. The rotating ring concept is kind of cliche now, after Contact they've been popping up everywhere. But I kind of like the idea of having a lot of multi-axis particle accelerators. Thanks, I'd really like to create and propose some concept models, but I don't have the skills to create final models. But I'd love to be part of the team! Antimatter can be produced in advanced colonies or purchased in colonies of other players. Ship needs not much antimatter, one "refueling" allows flying for a week or so. But I like ZPM idea more. Shield is necessary for any flight. Imagine that the ship accelerates to 100 km/s relative to sun to leave a star system (so-called third cosmic velocity). Then it arrives at a system located at the opposite side of the galaxy, it find ourselves moving with a velocity of about 500 km/s relative to interplanetary medium of that system. Interplanetary gas, dust, meteorites will hit the ship at a velocity 500 km/s. Small dust grains can cause significant damage. For this reason the shield is necessary. Another function of the shield is for air-breaking, it can be useful to save extra fuel for far-away missions in unexplored space, where refueling is difficult. The Delta-V - the maximum change of speed for the ship from one refuelling - can be from ~100 km/s for small universal ships to 1000-5000 km/s for large motherships. No, the player is human, he can leave the ship and fly around it in a space-suit, or walk on planets. And he can contol any of his ships by taking remote control of them. For example, if a player crashes a shuttle while landing on a planet and survives, he/she can land another shuttle remotely and return to the mothership in it. Why is it impossible if we assume FTL drive? At least we can use the mail drones. But direct communication is more useful. Imagine how the speed-of-light limit in communications/controls will affect gameplay. Player enters a system and wants to ask the 'system owner' player about something, for example he may call him to do some cooperative mission. He/she makes a call to that player, and... must wait 40 minutes till signal reaches him, and then the other player has to answer by return. Because players are separeted by 2.4 AU, Will these players wait? They will most likely use "real" communications like Skype or forum chat. This will be like FTL communication that bypasses the game's speed-of-light restriction. Look at the first post of this thread, I've put some sketches there made by our Russian guys. Well what I was wondering was if dust impacts during FTL, if FTL consists of "short jumps", it sounds like it doesn't occupy interveneing spaces, and dust will not be a problem. I know it will be necessary during sub-light travel. Is this correct, or is there acceleration during FTL? Maybe I should wait until you translate the spaceflight physics post I have many other questions about it, such as whether mass influences FTL. Why is it impossible if we assume FTL drive? At least we can use the mail drones.But direct communication is more useful. Yes, I know it's unconventional, but that's the draw of adherence to realism. No one has done it before. Don't be afraid to explore unknown gameplay mechanics, as we explore new worlds! It would be awesome if, instead of designing the gameplay top-down and assuming players will do certain things, you instead gave us basic tools and systems, and we will see what the implications of those tools are. If there are big problems, then you alter or develop a new system as technology "advances", and the gameplay emerges on its own. Let's look at how two different games were influenced by emergent gameplay. Look at EVE Online and how much of its gameplay was emergent. The game universe already starts at a high level of technology. Most of that emergent gameplay consists of "sociopolitical" implications of factions and resource control. Minecraft, on the otherhand, despite its unrealism, is actually more of a "simulation". You have some very basic systems in place, and the players used those systems and tools and created wonderous things. The community impacted the gameplay. Almost all of Minecraft's gameplay is emergent, and it is amazing. Just as we explore new worlds, we will be exploring new gameplay. Things like exactly how the player manipulates his ship in the system, how certain devices affect harvesting of asteroids, how commucation infrastructure affects the culture. The game will need beta testing anyway. Well, this is my vision for a realistic simulation game like this. If you do plan to do something like this, I urge you to start the technology at a more basic level. Oh well, I should probably stop analyzing things too much, and let you do your job But this is why I hope you will allow people to mod the game, or use the SDK non-commercially (for free if our mod/game is free). I would love an engine where I could alter the realism and explore these game concepts I have. Yes, I followed the Russian thread. SHW's stuff looks good. The modular truss design is very similar to some stuff I have played around with in the past. I think I will follow his basic design and alter them to show some tweaks I would make. "Short jump" is the instant teleportation of whole ship to a new position, saving its mechanical energy. So between jumps, the ship flies in a physical enviroment with some physical velocity and is exposed to meteorite bombardment. However, I am now developing a new FTL "theory" - acceleration of time in local area around the FTL drive. I don't play Minecraft, but I see it as a huge online sandbox. I want to develop a game with no "programming" limitations to gameplay (such as limited linear maps in HL2 or locations in EVE), but have physical-based limitations (for ships with its maximum acceleration, maximum delta-V etc, and for building on planets; having environmental conditions like atmospheric pressure, temperature, minerals etc). I don't know what gameplay to have in my game, but I want to focus it on exploration and player-to-player collaboration, instead of boring war/trading/mining. However, I am now developing a new FTL "theory" - acceleration of time in local area around the FTL drive. Ah, hmm... that would make FTL comms more realistic, actually. If you can accelerate time around the ship in proportion to the speed of light, then you can get around the whole problem of relativity, right? You can avoid paradoxes that way, maybe... This would also mean it's basically continuous thrust, you turn the time accelerator on, and the speed limit is lifted, right? Though, if the ship's local time is accelerated, we need suspended animation, or else our players experience hundreds of years of subjective time. I think this is plausible, you can just say the inertial dampening fluid immersion is also a cryopreservant. I want to develop a game with no "programming" limitations to gameplay (such as limited linear maps in HL2 or locations in EVE), but have physical-based limitations (for ships with its maximum acceleration, maximum delta-V etc, and for building on planets; having environmental conditions like atmospheric pressure, temperature, minerals etc). I don't know what gameplay to have in my game, but I want to focus it on exploration and player-to-player collaboration, instead of boring war/trading/mining. Good. I would encourage you to allow the gameplay to be emergent, at least during testing, then. First of all I would like to thank SpaceEngineer for this fantastic piece of software I've been waiting for since Braben's Elite II: Frontier. And like many of you here, I too discovered Infinity (I-Novae) Engine and was very enthusiastic about it, but alas, that was 5-6 years ago. Despite the lack of any (visible) progress in the recent years, IA (Flavien Brebion) still changed my perspective on the idea of the fully explorable procedural universe. Lately, that concept became even more feasible, and after Notch's major success, it actually became a reality. But, unlike Minecraft (which is cool in it's own way) SpaceEngine is a dream-come-true for me, in many ways. And I'm glad it came from someone with a clear passion for and understanding of our extraterrestrial surroundings. Please keep it that way Vladimir, and thank you! Shouldn't the thruster configuration be symmetrical? Or at least balanced? The way I understand this particular ship design, is that you have the most powerful thrusters in the rear, but you don't have as powerful counterthrusters, in order to slow down afterwards. And then, if you were to rotate the ship 180 degrees in order to neutralize the velocity vector, that would completely violate the purpose of the interplanetary dust shield, and expose the vulnerable parts of the ship to high-velocity micrometeorites. - astronomic: solar and subsolar bodies tend to orbit near the plane of ecliptic, and any large exception can be easily treated as anomaly and/or trivial to navigational concerns. - antropologic: humans are biologically accustomed to navigate on a (seemingly) flat plane with varying levels of elevation, which is effectively a motion in "2.5D", which in other words means they are more likely to locate something in 3D if they can distinguish up from down (rather abstract concepts in space). To me, both reasons imply something more "flying-saucerish", especially if we take low-orbiting with atmospheric drag into equation. However, I can appreciate the bulky "cigarish" spaceship design, which does resemble something I expect from the first-generation spacecraft designs with an intention of interstellar travel. So then, what is your general vision for the Newtonian/subluminal/interplanetary navigation? How do we make sudden changes in orientation/trajectory while travelling at high speeds (or do we have to make a full stop)? Are rotational (yaw/pitch/roll) thrusters limited in terms of angular velocity and subsequent unwanted centripetal and other forces (which are harsh in the case of cigar-shaped bodies, due to increased and unbalanced arm-lengths, and can kill the prospect of having acceleration-based artificial gravity, not to mention the ship construction)? Do you find circumstrafing an impossible maneuver, or is it something which should be done exclusively by lower class ships and only at lower speeds? Additional "breaking" thrusters is additional mass. But additional mass reduces delta-V of the ship (or increases fuel consumption rate). This is reason why "cigarish" design is more suitable than "flying saucer": the first needs a more compact frontal shield. Reducing of ship's mass is also a reason for open-frame construction of the ship: The external hull should cover only critical systems. Note that this is for thrusters only, not the whole engine. 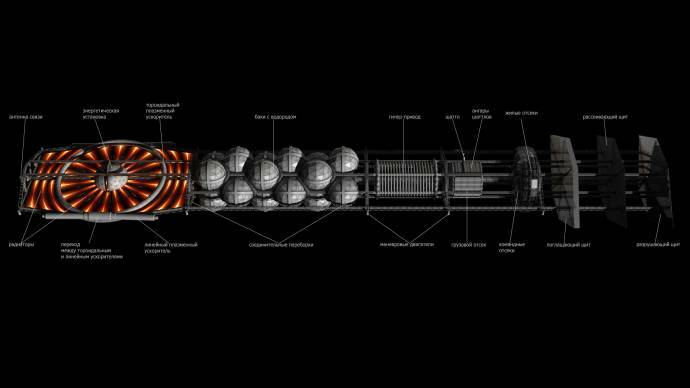 The engine is a massive construction, and this concept has only two engines (toroidal plasma accelerators). Every engine has two thrusters, that can be switched: acceleration and braking. Another solution is to have only one rotated thruster per engine. Rotation-based artificial gravity will be used more as acceleration-based, because acceleration/deceleration stage is relatively short, 5-10 minutes at thrust 10-20G. All other times the ship is in free-fall mode (weightlessness). This is done for gameplay: Does someone want wait for hours while his ship accelerates to desired velocity at 1G thrust? I really like SHW's engine design for that version, especially that the thrusters are just extensions from a circular particle/plasma accelerator. I hope it makes it into the final design. Agreed, I like the dual-thruster/accelerator concept as well, and I can see the benefits of cigar-shaped body. - Why aren't the destruction and scattering shields sloped? AFAIK it's better to partially deflect the incoming projectiles, then to absorb their kinetic energy (which would probably generate too much heat and ablate all three shields). That way I see flying at 0.5-0.99c is like diving through low-pressure debris fluid, therefore I imagine a secant ogive bullet shape design. Clearly, I'm arguing against the cigar-shape here, although I do like it, sorry. - How about having tangential rocket thrusters on the living quarters? These would slowly rotate the bay around the longitudinal axis, in times when there is no change in velocity (a = 0), and therefore simulate a gravitational force which would shift in three different modes (Stage I: negative longitudinal, Stage II: transversal/radial, Stage III: positive longitudinal), depending on the current state of motion (acceleration, stable velocity, and finally deceleration). This would be very interesting from the interior design perspective, as people would dislocate from walls to ceilings in a single journey, while the consoles, monitors, and gauges would remain static, but still accessible from all three surfaces simultaneously. Toroid shape really does make sense if this would be the case. Why aren't the destruction and scattering shields sloped? SHW tried to combine the shield with a ram-scoop for collecting hydrogen from the upper atmosphere of gas giants. Further calculations show that collecting it is too slow and it is better to use special collector ships and orbital station to store the collected hydrogen. The player's ship can quickly refuel at this station (simply detach empty tanks and replace them with filled ones). Our ships will not fly at such speeds, because interstellar travel uses a hyperdrive. Read here. To obtain rotational artifical gravity, the ship will have a rotating ring with free-rotating cabins attached to it. When the ring rotates, the cabins turn, so the floor will direct away from the rotation axis. When the ship accelerates with its engines, the cabins turn towards the thrust direction, so artifical gravity is still direct to floor. This system can be covered with a single hull, so it has no rotating parts in a vacuum, that would always have trouble with pressurization. I see. So the shielding design will change? But is it still a possibility? If the speed isn't artificially capped, the maximum speed is equal to the speed of accelerator particles, which I assume travel at nearly 1c. Would that tear the ship apart? Is there a natural cap to the maximum subluminal speed (within the dusty solar system, of course)? And if there is, will you simulate it? Or do you think that the scale of the game will prove to be so vast, noone would wait for that long? I'm lazy to do some calculations... We're probably speaking about days or months of RT acceleration, I dunno. Great, as that's really the next level of what I've proposed. Rotating cabins seem to solve the problem with lazy people rolling on the floor As well as the interior design issue. I guess we can all turn a blind eye on the excessive Gs for the sake of gameplay. But then, longer exposures to 10-15g might be even possible for humans, who knows, if we take rigorous training, genetic adaptations, and years of space voyaging into account. I doubt that anyone could walk under this much weight, though (I would weigh a ton lol). Perhaps this should also be taken in consideration? It just occured to me that the astronauts' bodies, hearts and lungs would have to be augmented somehow, to withstand high G. Thus an astronaut is much stronger (and able to carry his weight just as normal), and partially immune to blackouts and redouts. Of course, some kind of neural interfacing is also assumed. This goes well along with the full vision helmet you mentioned in the other topic. Maximum speed is called "delta-V", and determined by exhaust velocity and amount of reactive mass ("fuel"): see Tsiolkovsky rocket equation. Our designs have an exhaust velocity ~0.1c, and 50-70% of the ship's mass is hydrogen for engines. The acceleration stage takes only several minutes, so all the crew can lie in special g-compensation baths or diamegnetic levitation systems. The crew may live on the ship in breathable liquid, all habitation modules may be designed for liquid interior. The human body immersed in liquid can withstand an acceleration of 15-20 G.
However, gameplay assumes that ships carry only one human on-board: The player. All systems are fully automated, so the player can control everything (just as you would control your car). For one pilot, the ship can have diamagnetic inertia compensation system in the pilot's cabin. Passenger ships can simply use acceleration of 1G, so acceleration to 50 km/s (for interstellar flight) takes 1.3 hours. I don't think players will want to drive passenger ships, and give it to AI.